In 2012, a judge ordered Tu Nguyen to be civilly committed for up to six months. Eleven days later, he was released from the hospital, and within weeks had stabbed his neighbor to death in front of her 8-year-old granddaughter. Mary Miller's family is now asking Massachusetts' highest court to decide whether the hospital can be held responsible in a case that's stirring complex questions about whether mental health providers should be liable when former patients commit crimes. "This is a long-standing controversy in American law about third-party liability," said John Blum, a professor at the Loyola University Chicago's law school. Nguyen, who was diagnosed with schizophrenia and had a history of refusing to take his anti-psychotic medications, had been ordered to be held at Carney Hospital in Boston for no longer than six months or "until there is no longer a likelihood of serious harm by reason of mental illness." Attorneys for Miller's family say Nguyen was clearly still dangerous when he was discharged days later and that the hospital violated the court order by releasing him so early. An expert hired by the family notes that Nguyen had a history of threats and violence, including punching a doctor in the face during his stay at the hospital. The man is referred only as "N'' in court documents filed with the Supreme Judicial Court, but public records identify the person convicted in 72-year-old Miller's death as Nguyen. Nguyen, who pleaded guilty to breaking into Miller's apartment and stabbing her 22 days after he was released, was sentenced to life in prison in 2014. The court will hear arguments in the case on Thursday. A lower court judge threw out the family's case. Massachusetts is among many states that with laws that provide immunity to mental health professionals in such cases except in certain circumstances, like when the patient had expressed an explicit threat to kill the victim. But Massachusetts' law is silent on hospital corporations, which Miller's family interprets as leaving Carney Hospital on the hook. Many other states immunize both the physician and the hospital, said Barry Furrow, director of the health law program at Drexel University. 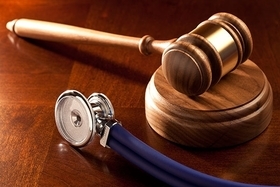 Furthermore, courts are generally leery to place blame on mental health providers because they worry facilities will overreact by holding patients longer than necessary, he said. "These cases are just so thorny because you don't want to put a burden on providers to overcommit," Furrow said. "I'm very sympathetic to the family, but the law is very much shaped to place the heavier burden on someone who wants to keep someone institutionalized," he said. Attorneys for the hospital say it doesn't make sense that a corporate entity — "with no ability to exercise clinical judgment or discretion" — should be held responsible while the doctor who actually treated him is shielded from liability. The hospital's lawyers, who didn't respond to emails from The Associated Press, say in court documents that the person treating Nguyen determined there was "no likelihood of imminent harm by reason of mental illness" when he was discharged. His discharge papers described him as "irritable" but "cognitively intact" and as having denied suicidal or homicidal thoughts, according to court documents. The Massachusetts-based Professional Liability Foundation says a ruling against the hospital could have wide-ranging implications on mental health providers in the state. Hospitals may be inclined to stop admitting psychiatric patients at a time when there's already a "critical shortage" of services or keep patients as long as they're legally allowed to out of fear of liability, an attorney for the group said in court documents.